Social network maps identify points of human connectivity. Map: Created by Dennis Coughlin using Inflow software. 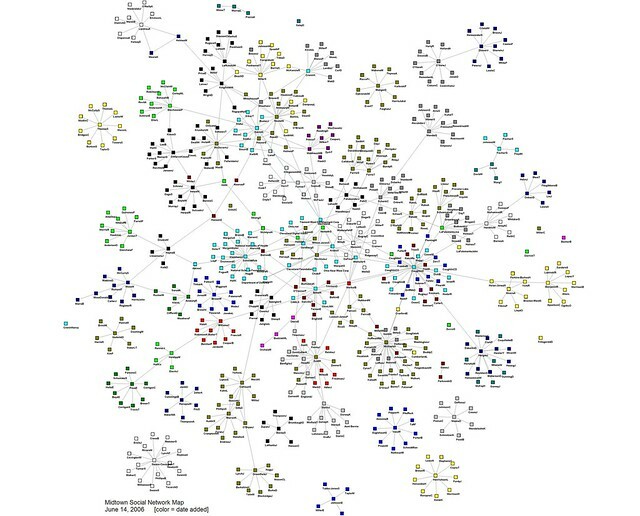 View the I-Open Social Network Maps Album on Flickr here. Open conversations build trust and offer starting points for entrepreneurs, businesses and large organizations to identify local creativity for collaboration and capacity building. Regions that invest in open conversations will be more resilient, agile and wiser than those who do not. "Guided" or, facilitated, conversations illuminate the insights and innovations of civic entrepreneurs - new enterprise opportunities in social, economic and environmental system disruption - inherent in the "wisdom of every crowd." Meet The Bloggers was a collaborating partner of Midtown Brews (2006-2009), a monthly civic forum focused on catalyzing enterprise opportunities at the intersection of technology, creative industries, and environment in Cleveland, Ohio. Simple Rule #1 - Open conversations means an intention to be inclusive – not necessarily "open to the public" – but with people who want to participate. Simple Rule #2 - Contributors need to adhere to certain behaviors (not a free-for-all – if you choose to become a part of the conversation you need to behave in certain ways) and not intentionally steer the conversation toward your own agenda. Simple Rule #3 - Contributors need to use a method of inquiry that is appreciative. Simple Rule #4 - There needs to be a shared open mindedness and a sense to be inclusive. Simple Rule #5 - The value of openness is that it has to do with being participatory – they are here to engage with us and we are here to engage with them, too. Simple Rule #6 - People we have are dynamic and we need to be as energetic. Simple Rule #7 - What you give, you will learn, and you will leave here with a deeper understanding (a more complex understanding – as information comes up, questions get asked) of the collective conversation. This is much more of an integrated approach to learning. Simple Rule #8 - A person needs to offer what they know – allowing the conversation to expand to the level of a quantum dialogue – an extended learning that goes beyond just giving explanations, which are fine up to a certain point, but beyond that it is the experiential and on-site aspects that are important for this kind of learning. Simple Rule #9 - The other people who are there have interests in common too. Simple Rule #10 - These are the basic parameters we agree around and this is the value. Simple Rule #11 - The intersection between creative industries, technology, and energy appeals to a variety of backgrounds. This is only one perspective. Try to play up the diversity aspect. Simple Rule #12 - There is value in urban areas and their inherent diversity. Open conversations are a powerful way to engage a community minded chain of businesses in any location. Are you leading conversations in your community or region? Share your stories and experiences with us in the comment section below. We'd like to hear from you! Click/tap the player below to watch.